The 12th annual MusiCares MAP Fund tribute concert will honor legendary GRAMMY-winning singer/songwriter Smokey Robinson at The Novo by Microsoft (formally Club Nokia) in Los Angeles on May 19. Robinson will receive the Stevie Ray Vaughan Award in recognition of his dedication and support of the MusiCares MAP Fund as well as his commitment to helping others with the addiction recovery process. Performers will include GRAMMY-nominated artists El DeBarge and Kem, and GRAMMY winners Kenny “Babyface” Edmonds and Cee Lo Green. Robinson will give a closing performance with his touring band. Actor and comedian Cedric the Entertainer will host the event. Additional performers will be announced shortly. The Miracles dominated the R&B scene throughout the 1960s and early 1970s. Robinson became vice president of Motown Records, serving as an in-house producer, talent scout and songwriter. In addition to writing hits for the Miracles, he wrote and produced hits for other Motown greats, including Marvin Gaye, Brenda Holloway, the Temptations, and Mary Wells. Robinson has received numerous awards, including the GRAMMY Legend Award, The Recording Academy Lifetime Achievement Award, four recordings inducted into the GRAMMY Hall Of Fame, an honorary doctorate from Howard University, Kennedy Center Honors, and the National Medal of Arts Award. He has also been inducted into the Rock and Roll Hall of Fame and the Songwriters Hall of Fame. He remained vice president of Motown Records until the sale of the company, shaping the label’s success with his friend and mentor Gordy. Following his tenure at Motown, Robinson has continued his impressive touring career and released several successful solo albums. All proceeds from the tribute concert will benefit the MusiCares MAP Fund, which provides members of the music community access to addiction recovery treatment regardless of their financial situation. 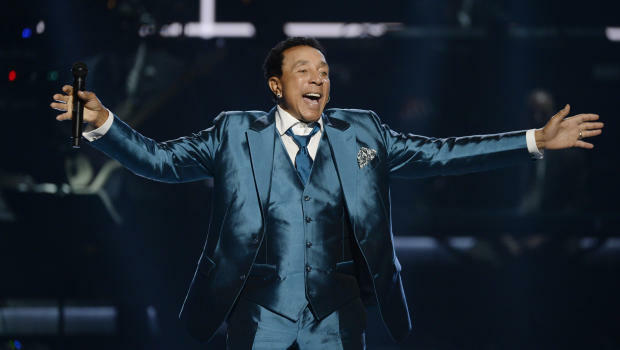 Smokey Robinson accepts the Lifetime Achievement Award during the 2015 BET Awards in Los Angeles, June 28, 2015. NEW YORK – Smokey Robinson is getting an award – this time for his charitable efforts. The icon will be honored on May 19 by the MusiCares MAP Fund, which provides members of the music community access to addiction recovery treatment regardless of their financial situation. Singers CeeLo Green, Kenny “Babyface” Edmonds, El DeBarge and Kem will perform in honor of Robinson at The Novo in Los Angeles. Tickets go on sale Monday. Robinson will receive the Stevie Ray Vaughan Award, which was given to Pete Townshend at last year’s benefit concert. The 76-year-old Robinson also will perform at the event, to be hosted by comedian-actor Cedric the Entertainer. Additional performers will be announced at a later date.